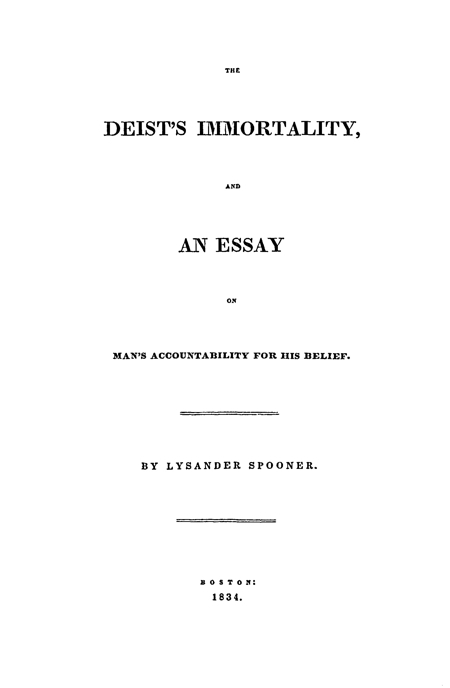 T.1 The Deist’s Immortality, and an Essay on Man’s Accountability for his Belief (1834). T.2 “To the Members of the Legislature of Massachusetts” (August 26, 1835). 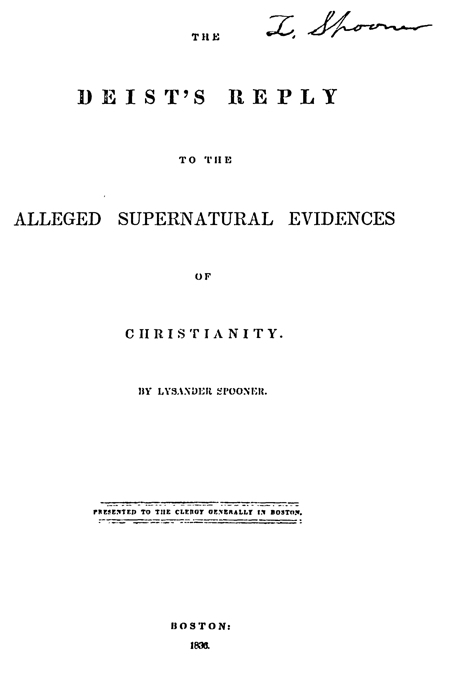 T.3 The Deist’s Reply to the Alleged Supernatural Evidences of Christianity (1836). T.4 Supreme Court of United States, January Term, 1839. 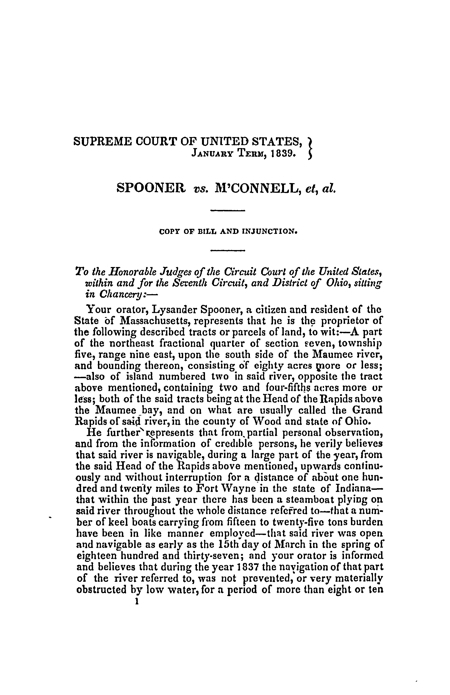 Spooner vs. M'Connell, et al. 1839). 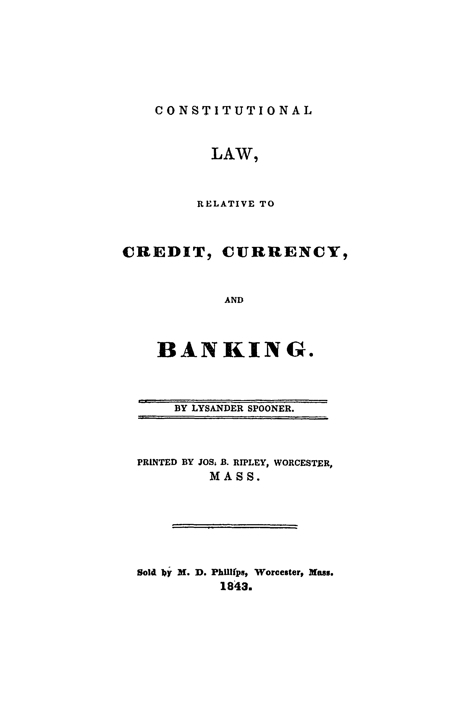 T.5 Constitutional Law, relative to Credit, Currency, and Banking (1843). 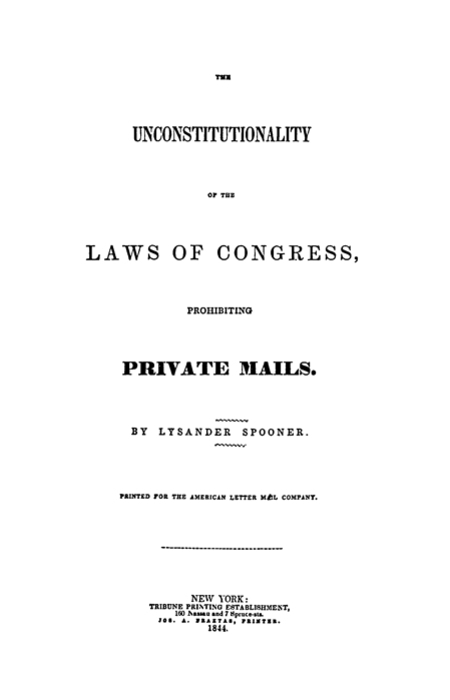 T.6 The Unconstitutionality of the Laws of Congress, Prohibiting Private Mails (1844). 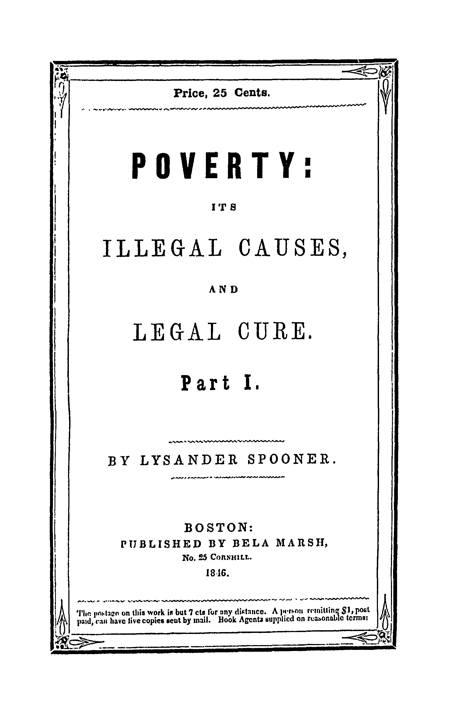 T.7 Poverty: its Illegal Causes and Legal Cure. Part First. 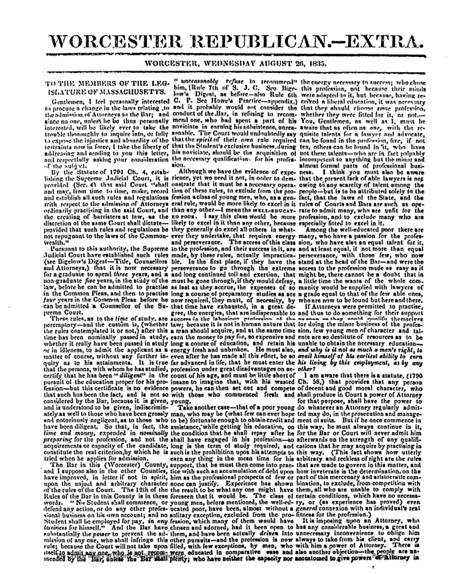 (1846). 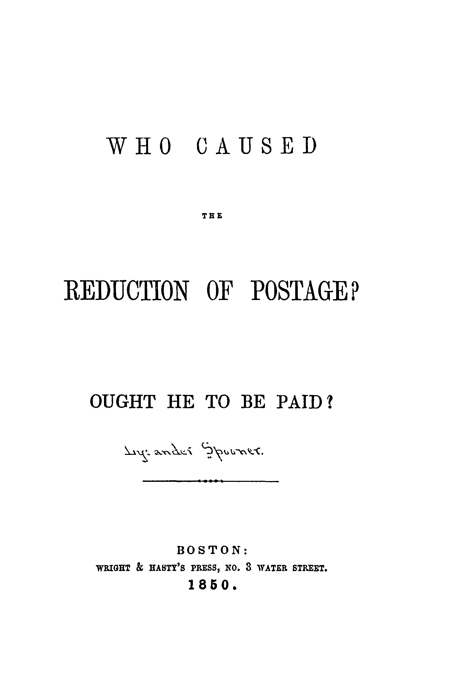 T.8 Who caused the Reduction of Postage? Ought he to be Paid? (1850). 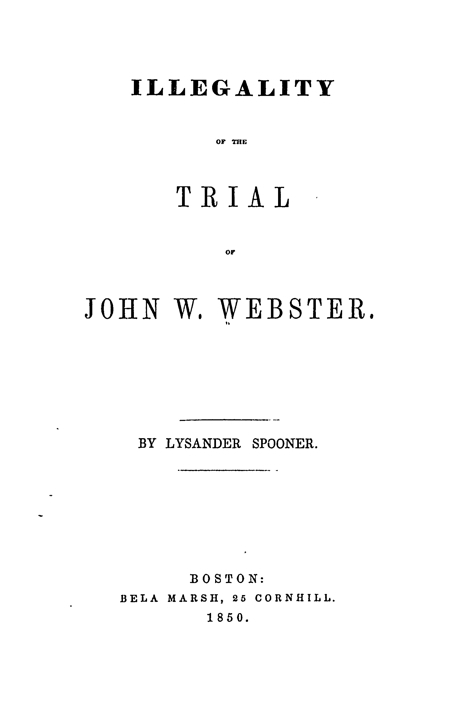 T.9 Illegality of the Trial of John W. Webster 1850). 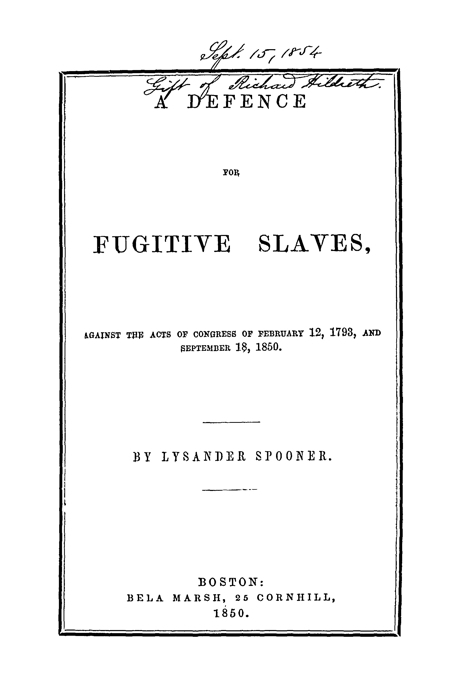 T.10 A Defence for Fugitive Slaves, against the Acts of Congress (1850). 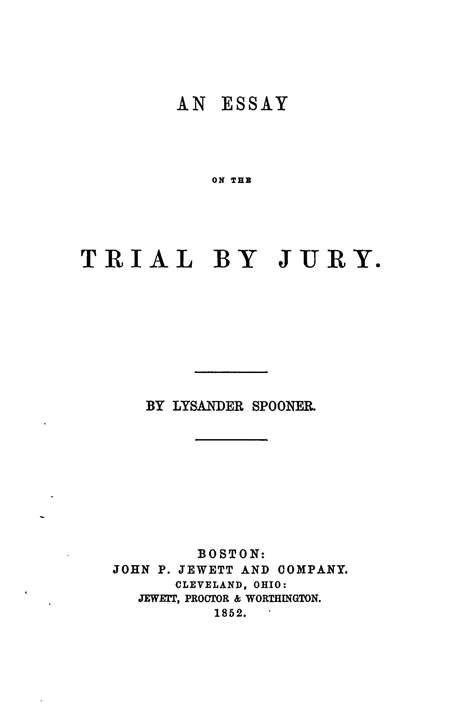 T.11 An Essay on the Trial by Jury (1852). 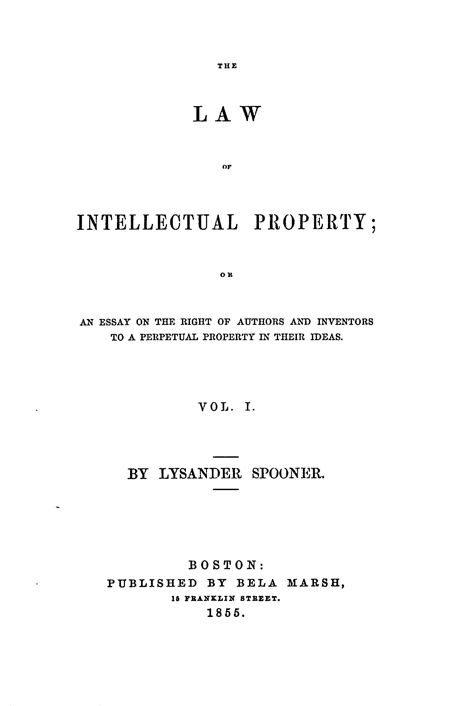 T.12 The Law of Intellectual Property; or An Essay on the Right of Authors and Inventors to a Perpetual Property in their Ideas (1855). 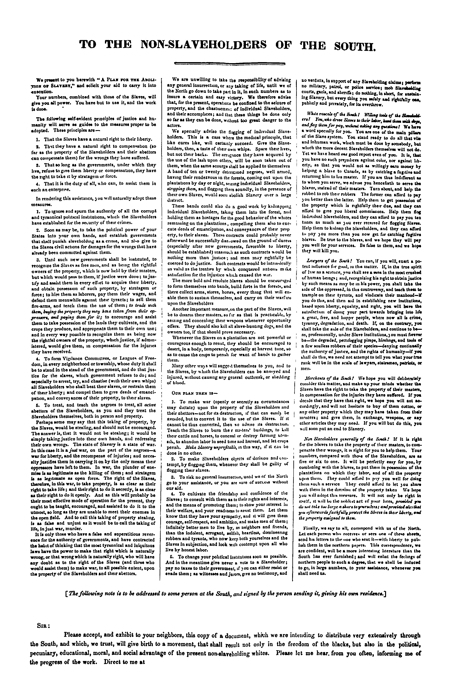 T.13 A Plan for the Abolition of Slavery, and To the Non-Slaveholders of the South (1858). 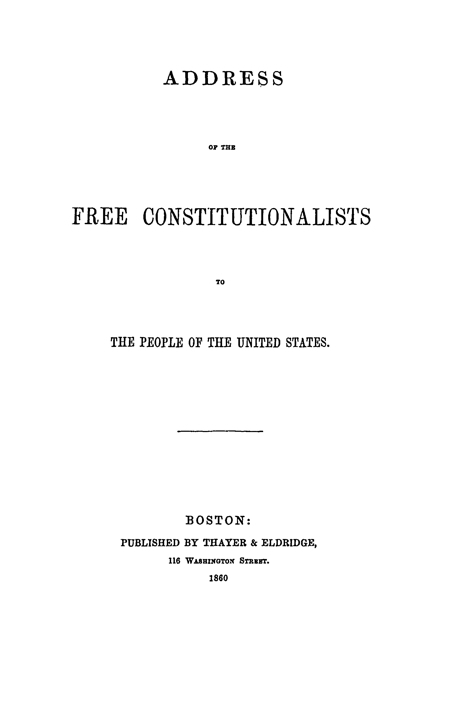 T.14 Address of the Free Constitutionalists to the People of the United States (1860). 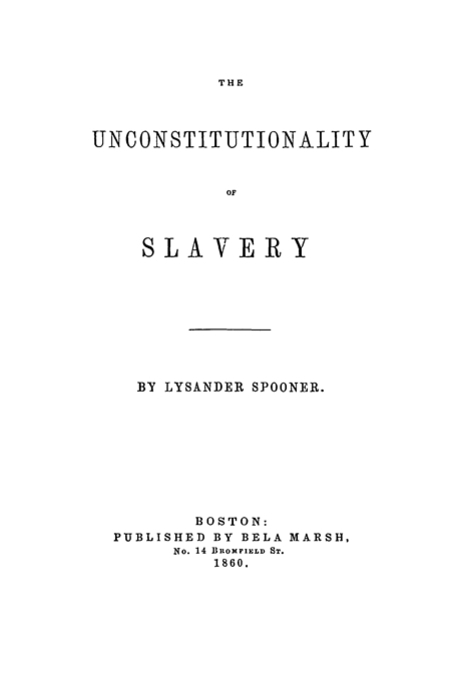 T.15 The Unconstitutionality of Slavery (1860). 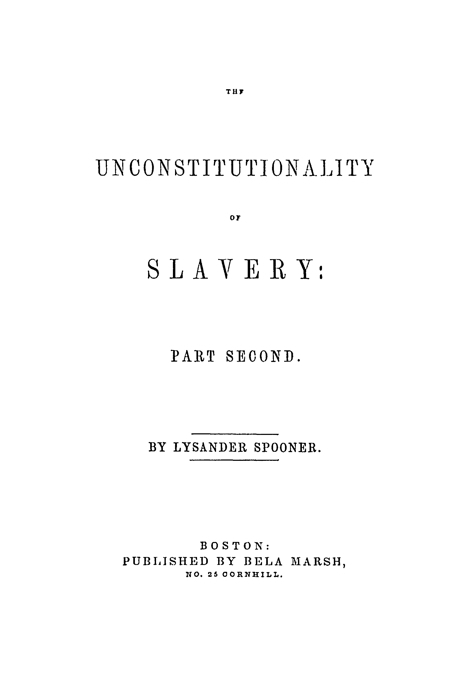 T.16 The Unconstitutionality of Slavery: Part Second 1860). 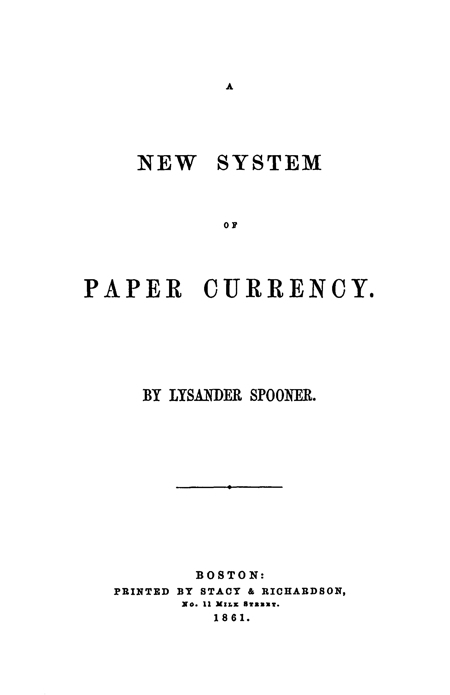 T.17 A New System of Paper Currency (1861). 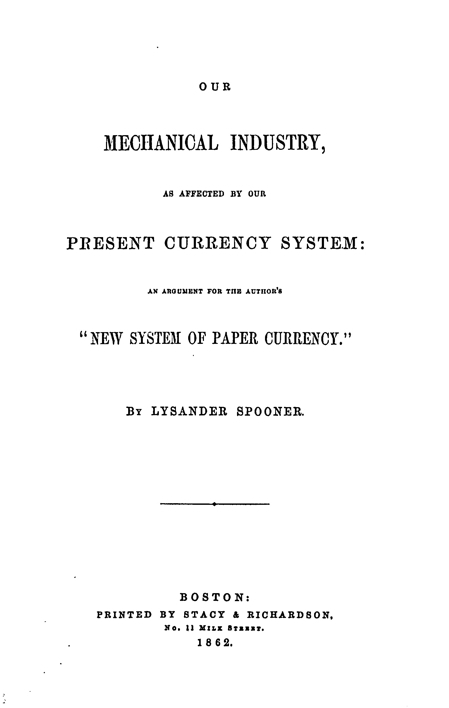 T.18 Our Mechanical Industry, as Affected by our Present Currency System: An Argument for the Author’s “New System of Paper Currency” (1862). 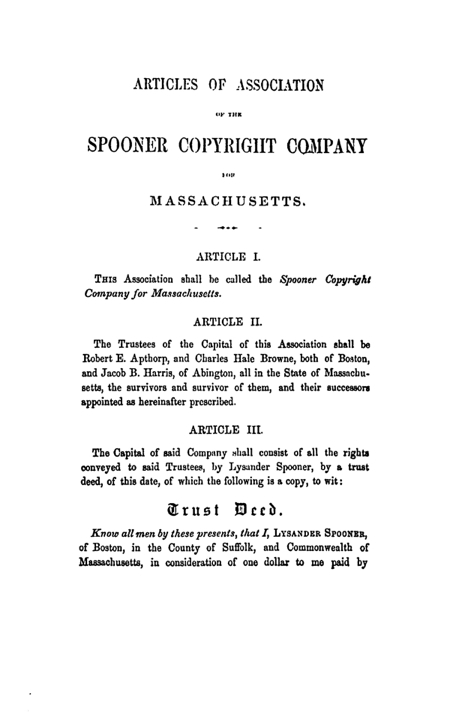 T.19 Articles of Association of the Spooner Copyright Company for Massachusetts (1863). 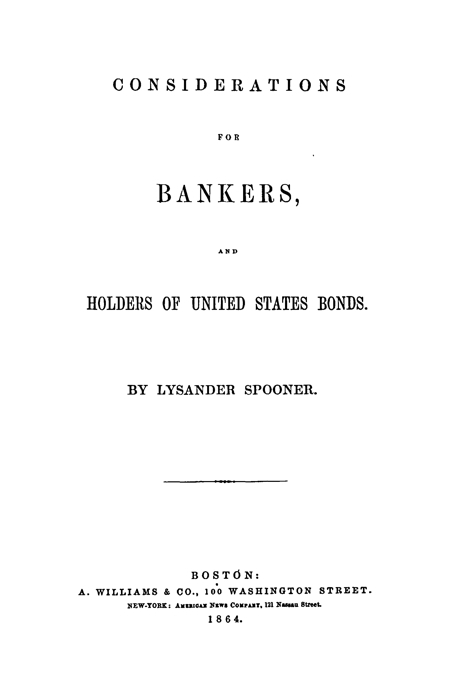 T.20 Considerations for Bankers, and Holders of United States Bonds (1864). 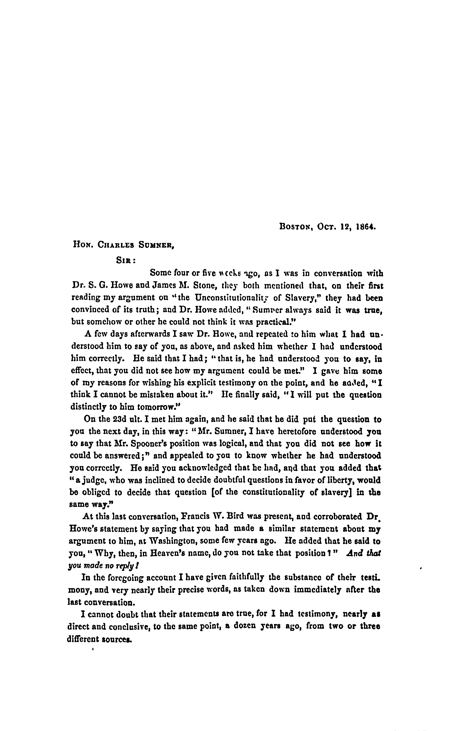 T.21 A Letter to Charles Sumner (1864). 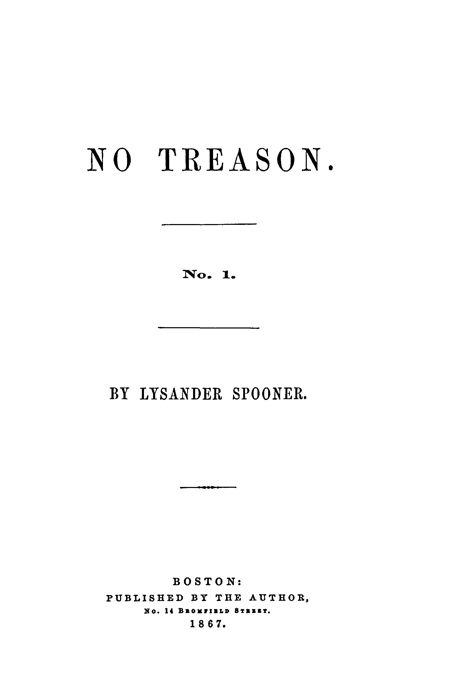 T.22 No Treason, No. 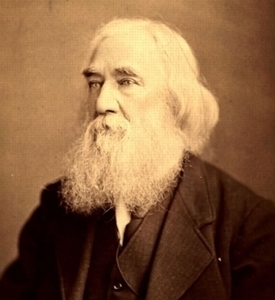 1 (1867). T.23 No Treason. 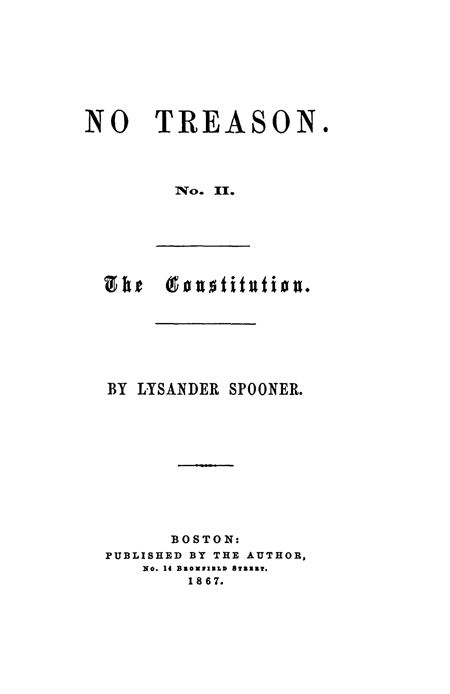 No II.The Constitution (1867). T.24 Senate-No. 824. 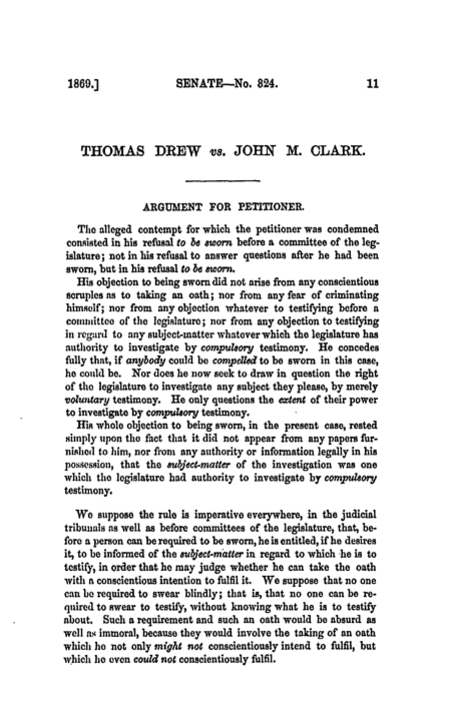 Thomas Drew vs. John M. Clark (1869). T.25 No Treason. No VI. 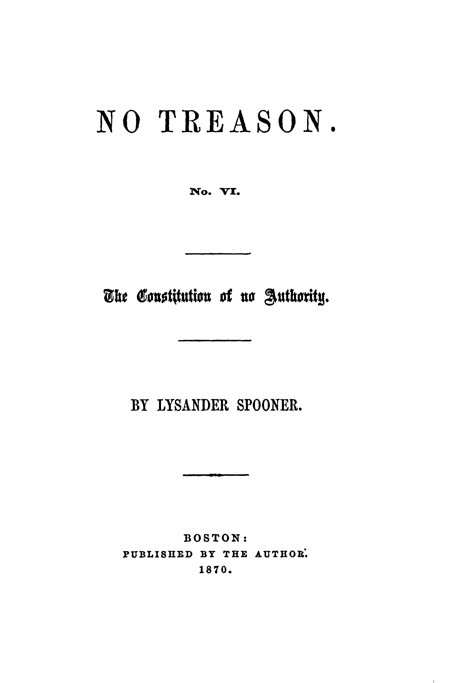 The Constitution of No Authority (1870). 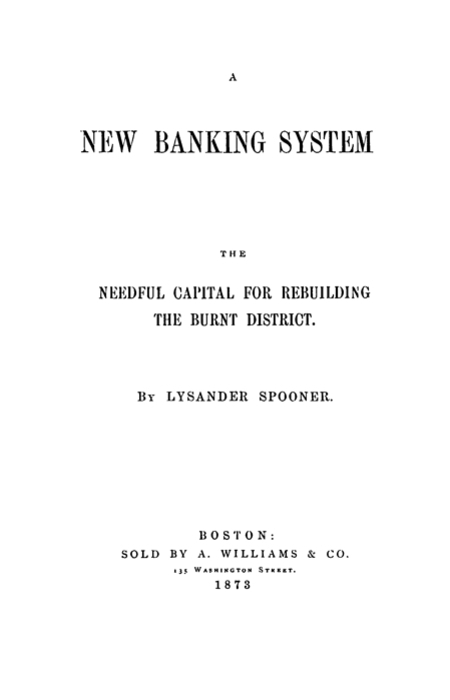 T.26 A New Banking System: The Needful Capital for Rebuilding the Burnt District (1873). 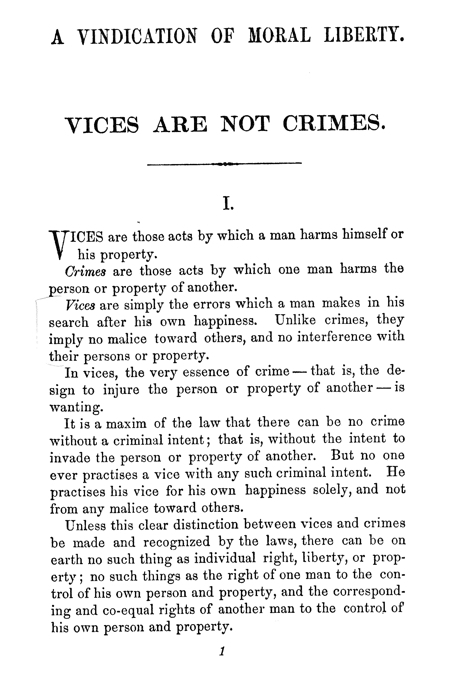 T.27 Vices are Not Crimes: A Vindication of Moral Liberty (1875). 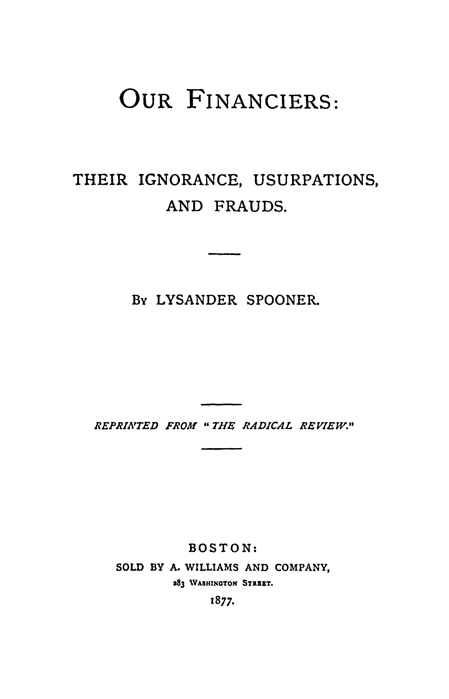 T.28 Our Financiers: Their Ignorance, Usurpations, and Frauds (1877). 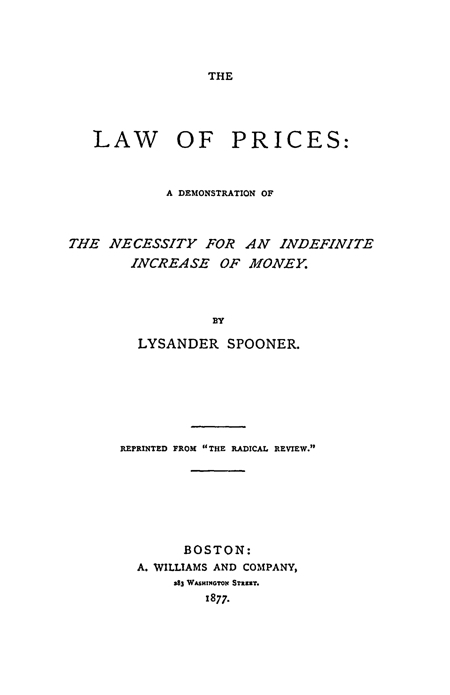 T.29 The Law of Prices: A Demonstration of the Necessity for an Indefinite Increase of Money (1877). 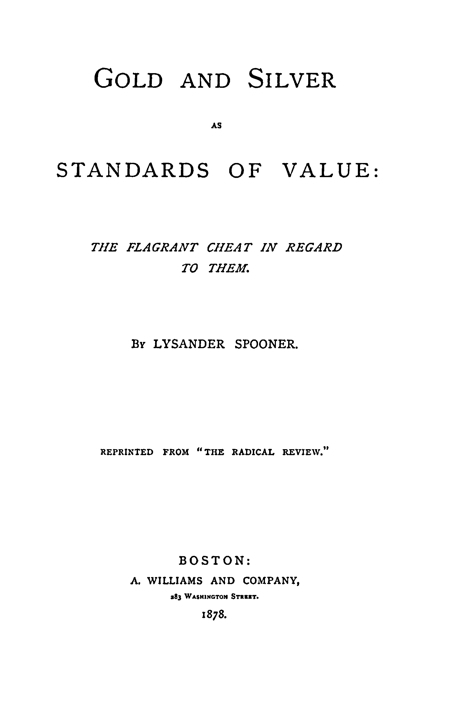 T.30 Gold and Silver as Standards of Value: The Flagrant Cheat in Regard to Them (1878). T.31 Universal Wealth shown to be Easily Attainable. 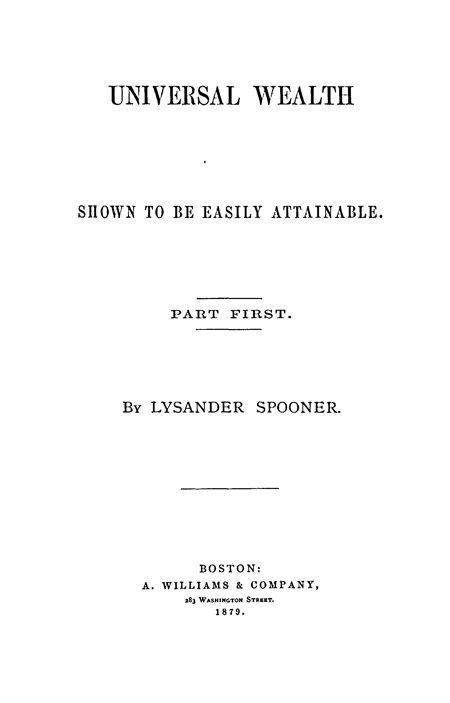 Part First (1879). T.32 No. 1. 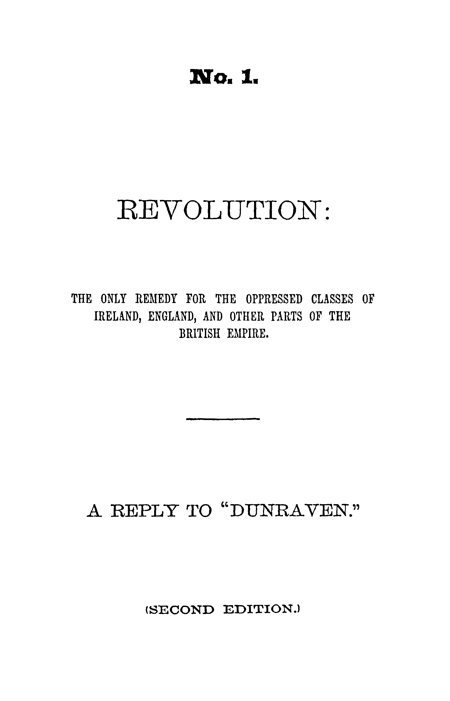 Revolution: The only Remedy for the Oppressed Classes of Ireland, England, and Other Parts of the British Empire (1880). 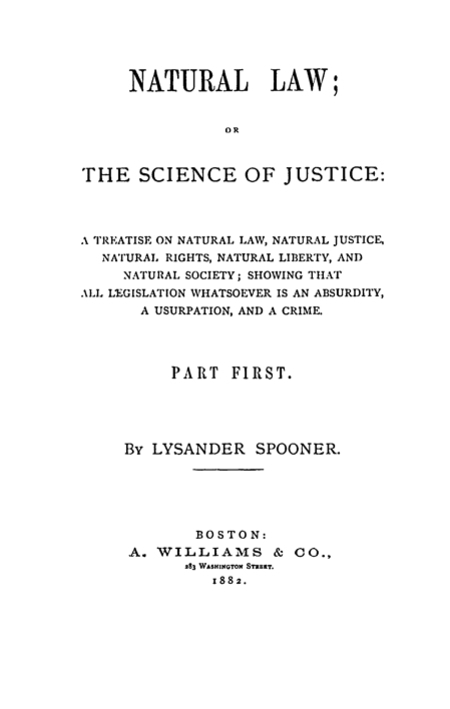 T.33 Natural Law; or the Science of Justice (1882). 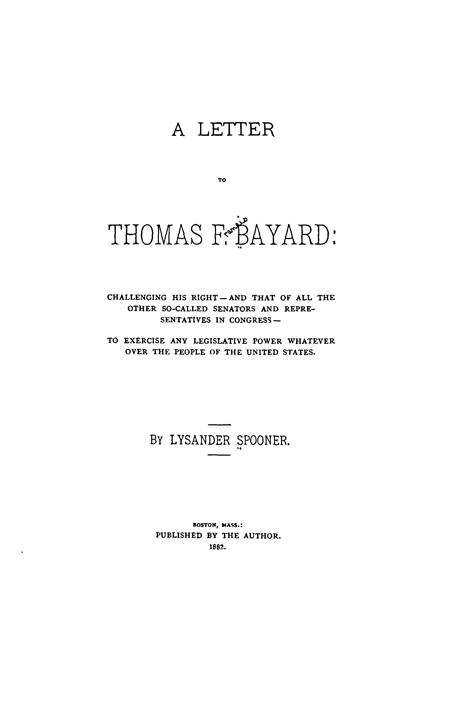 T.34 A Letter to Thomas F. Bayard: Challenging his Right - and that of all the Other Socalled Senators and Representatives in Congress - to Exercise any Legislative Power whatever over the People of the United States (1882). 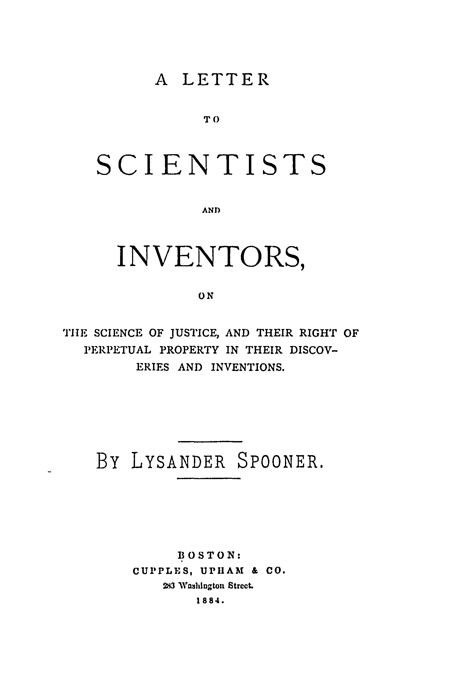 T.35 A Letter to Scientists and Inventors, on the Science of Justice, and their Right of Perpetual Property in their Discoveries and Inventions (1884). 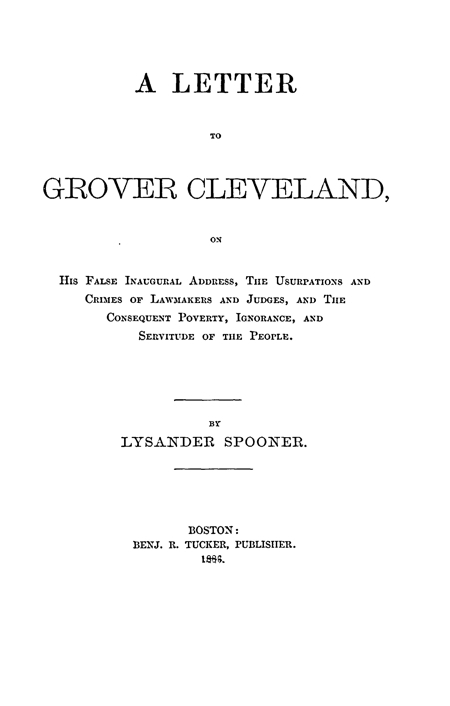 T.36 A Letter to Grover Cleveland, on his False Inaugural Address, the Usurpations and Crimes of Lawmakers and Judges, and the Consequent Poverty, Ignorance, and Servitude of the People (1886).